I've always been very tentative when it comes to skincare, never veering very far off of the "safe for even the most sensitive skin, dermatologically tested, fragrance free" path. But I've also had a ton of reactions and problems with my skin over the last 22 years (maybe a slight overreaction, but you get the jest). That being said, I've recently been more adventurous, investing in a lot of skincare products, hoping to clear up my acne, treat my rosacea, shrink my pores, and lighten the hyper pigmentation. Clearly, this job demands multiple skincare items. I've never really been a fan of facial wipes, having only really tried the Ole Henriksen ones. I always felt like they left a residue on the skin. I also felt like they were completely wasteful, throwing out a cloth after each use, when I could just as easily use a face cloth (or flannel, or muslin cloth, depending what you call them), and keep washing and reusing them. 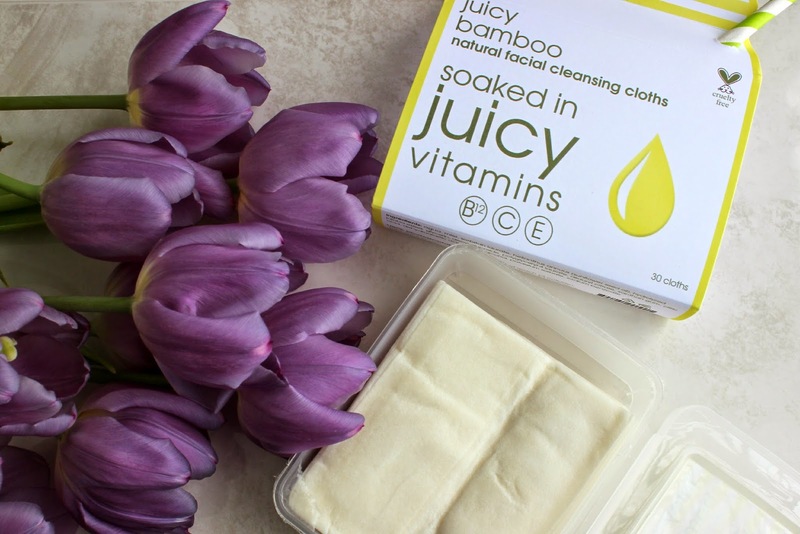 When Kaia Naturals contacted me and asked if I would be interested in trying their Juicy Bamboo Facial Cleansing Cloths*, I jumped at the chance for a number of reasons. First, the cloths are made from 100% bamboo grass, a very sustainable substance, and are therefore 100% biodegradable (throw it in the green bin, folks!). Second, the cloths are soaked in heated and liquefied honey (something that I've been told time and time again is an amazing natural alternative for acne), vitamin b12 (something I've been deficient in for the last 6 months and have been getting regular shots to boost), vitamin C, and vitamin E. And as an added bonus, they are also cruelty free! I was a bit afraid that these cloths would irritate my already stressed out face. But they felt amazing. They are designed to work for even the most sensitive skin and eyes (raises hand), and I would vouch for that. I go through periods where if you splash my face with water the wrong way, it reacts funny. But these cloths were very soothing, soft, and smelled ah-maz-ing (like neocitran, but in a good way). 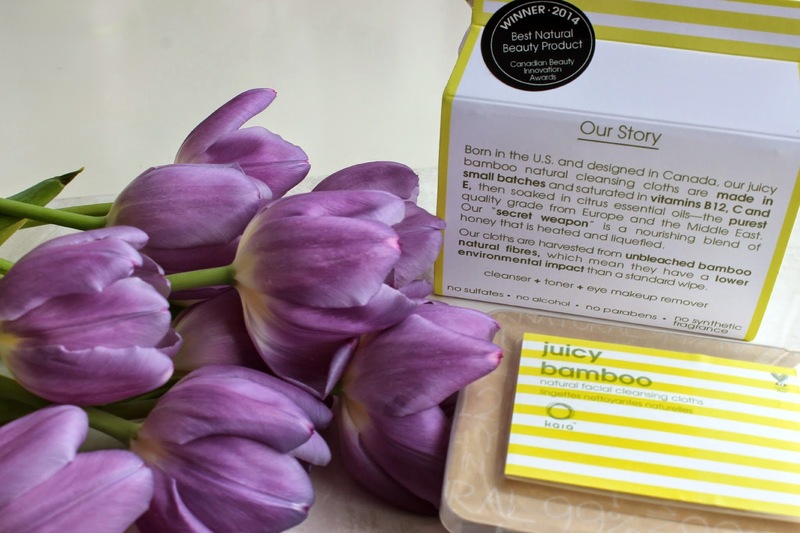 I also loved how my skin felt like skin after I used it--no greasy residue, no makeup left behind. Just cleaned, moisturized skin. While I'll still be working with a slew of other skincare items to clear up this persistent acne (seriously skin, get your act together), I can easily see myself reaching for these when I'm glued to the computer screen, and can't be bothered to get up and take my face off (evidently, the box is now perched on my desk, somewhere between my lipsticks and pencil holder). Interested in the product? A box of 30 cloths is $15.50, and a travel sized box with individually wrapped cloths is $19.50. For you Canadians out there, Holt Renfrew is now a proud supplier, but you can get a full list of distributors here.